MATTHEW MOSS IS THE ORIGINAL FOUNDER of the National Gallery of Ireland’s first Conservation Laboratory. As chief conservator of the laboratory the author restored Rembrandt’s Rest on the Flight into Egypt, Nicolas Poussin’s Acis and Galatea and Giotto’s frescos in Assisi. 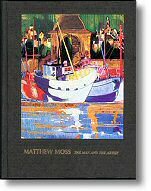 Some of these monographs are limited edition or have original illustrations signed and dated by the artist. Standard E.U. 4 to 14 business days after shipping (sometimes it can be up to 21 business days). Irish Academic Press,148 pages, hardcover. Practical examples on how to examine and handle old paintings safely. What is the safest environment to hang your painting. Caring for Old Master Painting, contains a practical guide, in the seven major European languages, to help you learn the terms most commonly used in conservation. An Important and beautifully produced book that makes a valuable addition to the the literature of present-day art. contains twenty full-coloured illustrations tipped in by hand. This is a rare technique that has almost disappeared except for some fine-art publications. The book is the product of the best Italian craftsmanship. Its countersunk illustrated binding protected by a clear acetate dust cover. 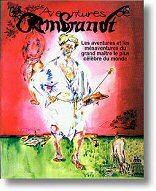 English language version with 50+ full colour illustrations is included,with Les Aventures de Rembrandt as a PDF DVD. (The Adventures of Rembrandt) is the book of the exhibition the artists held in Leiden (Rembrandt's place of birth) during the celebrations, Rembrandt400 in Holland to celebrate the 400th anniversary of Rembrandt van Rijn’s birth. The monograph contains 50 illustrations, 10 in colour, printed by hand and signed by the artist. Monaco Mon Amour is illustrated with 56 full colour landscapes and sepia drawings. is a limited edition, beautifully illustrated book printed on heavy Italian cartridge paper. The title of the monograph is inspired by the artist’s logo, showing Matthew’s commitment to interpreting the Principality of Monaco’s magical subtropical landscape. A French text accompanies the full coloured landscapes and sepia drawings. The chapter dedicated to the history of Old Master paintings in the Principality is, at present, the only source available on this interesting subject. 296 pages, softcover. US $15.50. Published by the Conseil National of the Principality of Monaco. is a unique database of artists, painters, sculptors, musicians and other creative professionals working and living in the Principality of Monaco. Contains names, addresses telephone, email and Web sites of the talented individuals, groups and art professionals in the vanguard of the Principality's Fine-Arts Renaissance. is the full French version of Caring for Old Master Paintings. It is an Open Format PDF permitting you to easily download and study it. This medium allows a higher resolution of the images than a printed version. In some way it is a more economic and easier to handle edition of this classic work.